Text Neck is becoming a pain in the neck! compromised positions, more people are developing symptoms of neck pain and headaches. As people sit and stand looking down at the screens, they are experiencing neck pain from strain of the muscles, tendons, ligaments and misalignment of the joints of the spine. People of all ages are using smartphones to text and use social media all day long. It’s one of the most common forms of communication. With the head and neck in the position looking down, it causes over use of the structures of the neck and results in pain. Chiropractor, Dr. Dean L. Fishman coined the term “text neck” which is also called “iNeck pain”. Here is a detailed article: Could You Have Text Neck Syndrome? It’s very important for any doctor that treats patients with neck pain and headaches to take a thorough history. Part of the history should be asking how much time you are spending using your mobile devices. Some worker’s compensation cases are now looking at patient’s phone records to see reports of text messaging to prove the injuries are from personal time, not work time. Research is showing the affects of text neck go beyond just neck pain. (Psychophysiological Patterns During Cell Phone Text Messaging: A Preliminary Study) It is also affecting other areas of health, including increased tensions, heart rates and holding breath. This could be due to the affect of compressing nerves in the neck when the vertebra misalign. When the neck is held in these postures too long, the bones become misaligned putting pressure on the nerves. Chiropractors have always explained these misalignments as subluxations which will decrease the function and health of the body. Compounding the problem of text neck is that most people are sitting in front of their computers for several hours each day. This also puts the neck in a compromised position further exacerbating the neck pain and shoulder tension. More subluxations, more compression of the nerves and discs, leading to more pain and possible chronic conditions down the road. 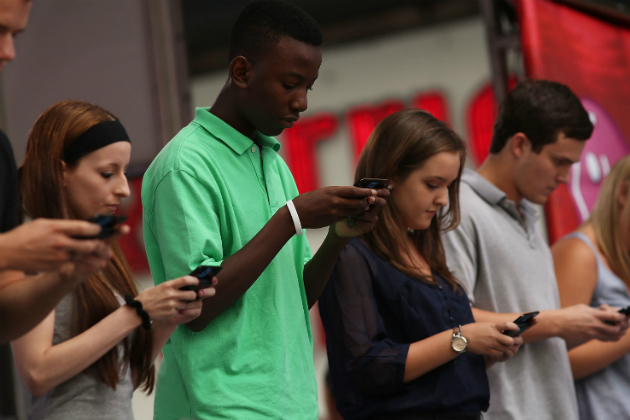 Text neck is a condition being seen in all ages. Being technology is fairly new, we might see more musculoskeletal problems and health conditions in following decades resulting from the overuse injuries from texting, playing games on phones, social media, etc. Chiropractors are the best health care providers to be able to help patients with text neck. Chiropractors are experts in subluxations, nerve compression and postural correction. A chiropractic treatment plan is to adjust your subluxations removing pressure from the nerves and increase your range of motion. This naturally relieves the pain you were experiencing. Advise is also given to prevent future injuries from text neck. 1) Take frequent breaks while texting or working at your computer. You shouldn’t spend more than 15 minutes at a time texting. 2) Posture is important. Instead of texting with your head and neck bent forward, sit upright with your phone in front of you at about eye level. This helps take away the tension from your neck and shoulder muscles. 3) If your phone has voice to text capabilities, use them as you won’t have to be bent over typing. 4) Stretch your neck and shoulder muscles. I created a video on stretching which you can view by clicking here: Home Stretching Neck and Shoulders. 5) Make sure you are optimally hydrated. Most people do not drink enough water. You should be drinking half your body weight in ounces of water. Also, drinking coffee and other caffeine products significantly dehydrates you and can lead to increase pain and muscle tension. 6) Best advice I can give… just pick up the phone and make a call. I’m sure your friends or loved ones would much rather hear your voice! If you or somebody you know is experiencing neck pain and tension and you notice they spend a lot of time on their phone, they might be experiencing text neck. Share this blog with them and make sure they see a chiropractor as quickly as possible. The sooner text neck is treated the better the outcome and prevent further problems. Dr. Russell Brokstein is the chiropractor and owner of Hometown Family Wellness Center in Freehold NJ. He has been treating patients for over 15 years and has noticed a significant increase in text neck and other ergonomic conditions. He incorporates chiropractic adjustments with therapeutic stretching to get to the cause of text neck, as well as other therapies if found necessary. For more information click here. Osteoarthritic Knee Pain is Common but Can Be Helped by Chiropractic! decreased motion and even sometimes bone spurs. Many doctors say this is a normal part of aging. More middle-aged people are seeking knee replacement surgery for ostoearthritic knee pain. These surgeries are both invasive and cost a lot of money. If people would seek early conservative treatment, surgery could be avoided. Is osteoarthritis really normal wear and tear with aging? Imagine if you never brushed your teeth or gone to the dentist… would tooth decay be a normal part of aging? What if you never brought your car for maintenance… wouldn’t the car break down more as it got older and you drove it more? Doesn’t it make sense that as you put more stress into your body, your joints would wear and tear more without taking care of them? A study: The Effect of a Manual Therapy Knee Protocol on Osteoarthritic Knee Pain: A Randomised Control Trial shows that chiropractic adjustments can help relieve osteoarthritis of the knee. The treatment group receiving chiropractic care showed a significant decrease in pain levels. The patients also noted a decrease in crepitus (grinding and clicking), improvement in the motions of the knee and improved the ability to perform regular daily activities. No adverse side effects were reported by the chiropractic patients. Those in the control group did not experience the benefits seen in the patients that received chiropractic care. It’s important to not wait for the joints of your knees, spine, shoulders and other areas to misalign with daily stress, poor postures and injuries. The longer joints are out of alignment the pressure causes an increase in osteoarthritis and other degenerative conditions of the joints and discs between the vertebra. Chiropractic helps conditions like osteoarthritic knee pain by aligning the joints, reducing inflammation, improving gait, motion and flexibility. If you experience knee pain, let us help you avoid unnecessary surgery and harmful medications that are commonly prescribed by medical doctors. you walk, the mechanics of your gait are altered. If you are standing all day, your posture will not be balanced and can lead to not only low back pain, but neck pain as well. When arches aren’t supported properly, you can develop foot pain, heel pain, plantar fascitis and heel spurs. If you view the picture to the right you will see the 5 Red Flags of pronation signifying foot problems and could benefit from foot orthotics. 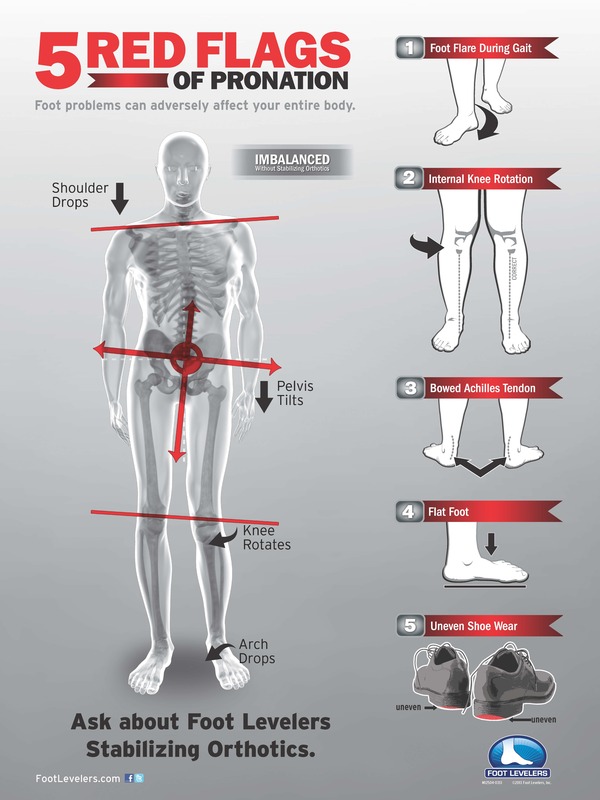 Foot orthotics help balance the feet and prevent postural distortions that lead to back pain. Quality orthotics are specifically made for each individual patient as everybody’s feet are different. It’s important to note how your practitioner custom fits you for foot orthotics. In the past, many podiatrists made orthotics by having a patient lie down and making a cast of each foot. The problem with this is you do not get a true sense of what happens to the patient’s arches when they stand and are weight bearing. Today, many practitioners are using modern technology where a patient stands on a scanner that shows where the arch is dropping and needs the most support. A custom made foot orthotic is made in this manner to provide biomechanical support. This helps to properly stabilize the arch, redistribute your weight, increase shock absorption, decrease pronation and balance the spine. Can you see how this will reduce back pain? Studies are now showing how foot orthotics benefit in relieving back pain. One study showed that 66 patients who had back pain after a car accident improved more when treated with foot orthotics over the other half of the group that received pain medication and exercise therapy. Read the study: Effects of customized foot orthotics on reported disability and analgesic use in patients with chronic low back pain associated with motor vehicle collisions. Another study shows that foot orthotics along with chiropractic treatment had additional benefits. Patients that received chiropractic treatment and foot orthotics had better patient outcomes than those patients that just were fitted for orthotics alone. The patients showed better improvement in pain, quality of life, improved function and disability. More info about the study by clicking here: Chiropractic adjustments and orthotics reduced symptoms for standing workers. When chiropractors adjust the spine, foot and knees there is an improvement in motion of the joints, alignment, and decrease in muscle strain which allows for the feet to adapt to the orthotics more quickly. I also find that when patients use foot orthotics it helps support the chiropractic adjustments in balancing the foundation of the feet and preventing pronation that could unstabilize the spine again. At Hometown Family Wellness Center in Freehold NJ Chiropractor, Dr. Russell Brokstein has been helping patients with lower back pain by adjusting his patients and checking for the 5 red flags of foot pronation that can lead to the back pain. It’s important to find a chiropractor that adjusts ankles, feet and knees and fits patients for foot orthotics that are spinal pelvic stabilizers. Dr. Brokstein keeps up with current research to provide his patients optimal treatment to recover as quickly as possible and once again enjoy their normal daily activities. For more information on Dr. Brokstein and his practice click here. Is your head pounding again with another headache? Are you sick and tired of reaching for another drug for the treatment of headaches? There are many ways to relieve your headache but the medications are usually just temporary at masking the symptoms. It’s because the pills do not get to the actual cause of the problem and then you have to worry about the side effects of the medication. Most headaches are caused by neck problems. This makes chiropractic extremely effective of treatment of headaches. from neck problems? Statistics show up to 80% of headaches are in actuality what are termed cervicogenic headaches. So doesn’t it make sense if this is the cause, then if we work on the neck it would be the most effective way for treatment of headaches? You may have experienced an accident or injury to your neck. You might have played sports or bumped into causing the head and neck to whip straining the joints and ligaments. You might have even slept in bad positions or maintain bad postures that put stress into the neck. Something few people think of is the pressure doctors put on your neck when you are being born. The accumulative effects of stress and trauma into the spine causes dysfunctions of the neck. Cervicogenic headaches can have symptoms that mimic migraines and tension headaches. Chiropractors analyze the neck and causes of the headaches. Using gentle, safe techniques in the treatment of headaches makes chiropractic extremely effective. A study: Illustrating risk difference and number needed to treat from a randomized controlled trial of spinal manipulation for cervicogenic headache. In this study 80 patients suffering with headaches were split into chiropractic treatment and massage. Follow up at 12 and 24 weeks were to compare outcomes of the two groups. The chiropractic group improved significantly more than the patients who received massage. Those patients that received chiropractic for treatment of headaches had reduction in both pain and number of headaches compared to the massage group. There was also improved quality of life with less interference of normal daily activities and less disability in the chiropractic group. The study concluded that patients who seek chiropractic as their treatment of headaches had significant advantage over massage. Chiropractic patients saw an improvement in number, severity and disability caused by their headaches. This demonstrates the amazing natural benefits of chiropractic in the treatment of headaches. Dr. Russell Brokstein is a chiropractor in Freehold, NJ. He has over 16 years experience helping in treatment of headaches. A thorough examination usually reveals restriction in the patient’s range of motion. The headaches and neck restrictions can be debilitating and effect the quality of life. Dr. Brokstein addresses the areas of restrictions. This removes the cause of the headaches and patients can once again enjoy their normal daily activities. If you suffer with headaches and live in central NJ, make sure you click here to get the most natural, effective treatment of headaches.